In sharing the story of how he began to pray the Rosary, Matt Fradd talks about what it really is and how powerful it can be. He started out thinking it was just a weird necklace old ladies held onto during Mass, but he grew to learn how some of the most influential saints in the world considered the Rosary to be among the most formidable weapons against evil. Matt strongly recommends making an effort to pray the Rosary, starting small if you have to. He talks about the obstacles we need to overcome, and the excuses we make that prevent us from praying this holy prayer. To help Catholics enter into the mysteries of the Rosary, Matt Fradd has written a guide! 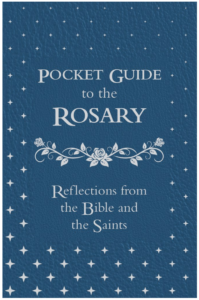 A Pocket Guide to the Rosary is a small book that will have a big impact on your prayer life and improve your ability to pray what St. Padre Pio called “the weapon of our times”. Preorder it here!